We don’t know much about how dogs and cats were domesticated. We have never recorded the process of the domestication of a wild animal. The fact that we have successfully orchestrated the domestication of foxes is amazing. There are very few domesticated foxes in the world, they are part of a 60-year-old Russian experiment by Dmitry Belyayev involving a process that could be described as evolution. Dmitry chose, out of a large selection of wild foxes, the foxes that showed the least aggression towards humans. Those friendly foxes were allowed to breed, then the same process was applied to the offspring. This process continued and eventually 70% of the foxes had reached a high level of friendliness. This meant that the foxes showed no fear or aggression towards humans whatsoever unless provoked. This was a breakthrough and even after Dmitry died in 1985, the experiment continued. The experiment is still going on to this day. These domesticated foxes also look noticeably different. This happened because of countless years of breeding and careful picking of traits in foxes. They have floppy ears, more diverse and interesting fur patterns, and shorter snouts. This is because of a phenomenon called Domestication Syndrome. This happens because of a decreased amount of adrenaline. Adrenaline is a chemical that makes us scared, angry, etc. AKA the fight or flight chemical. When Dmitry bred animals to have less adrenaline, their body changed. Adrenaline controls parts of how we look, the color of the fur is controlled by adrenaline, adrenaline helps make cartilage in the ears at a young age, adrenaline helps the growth of the face, etc. When the amount of adrenaline is decreased, adrenaline has less control over these things. Less cartilage in the ears causes the floppy ears, less adrenaline controlling the color of the fur allows for interesting and colorful patterns, less adrenaline aiding in the growth of the face causes the snout to become shorter. This is what scientists believe happened to dogs while being domesticated. 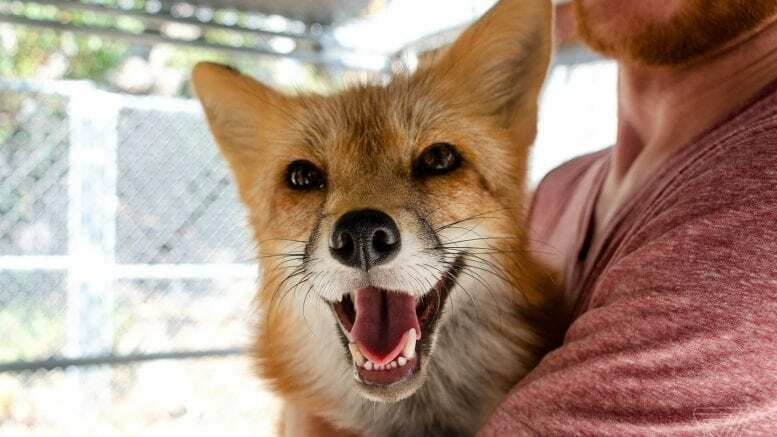 These foxes provide information about how dogs were domesticated, they are a behavioral stepping stone and are well on their way to be “hyper-social” like dogs. Many people confuse domestication and training. If you have seen people with lions as pets, or people with raccoons as pets, those animals have been hand raised and trained to be friendly, and while yes, they will approach you and will not attack you, they cannot compare to dogs in any way. They are not social, they will not look for you for safety when they are scared. Hand raised animals will just tolerate you, while domesticated animals will see you like family, a source of safety. So let’s look at the numbers- the Verge, a YouTube news sensation, visited the group of domesticated foxes in Russia, and they posed an experiment. One by one the foxes would be put into a cage with someone sitting in the middle of the floor with a circle drawn on the floor one meter away from him, the foxes would enter and would be recorded, they looked at the amount of time, and the data that was found was phenomenal. Every fox that was put in would go up to the person, greet them with a sniff, interact with them, but would then go and relax somewhere else. This is believed to be a fault of limited socialization at a young age, not of the breeding process. If the foxes were allowed to socialize more in the lab, they would most likely be more social.